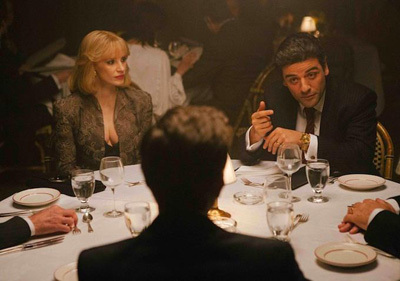 In A Most Violent Year, director J.C. Chandor captures 1981 New York City in vivid detail. At times, he punctures his canvas with obvious dialogue, but overall the film succeeds as a striking, timeless tale about an immigrant businessman’s perseverance. Genre fans may dismiss A Most Violent Year as The Least Violent Crime Film Ever Made, but that doesn’t mean it lacks intensity. That intensity comes mainly from what I will refer to as ‘The Art of the Stare.’ In an early scene, Abel teaches his new stock of bright-eyed salesmen how to look at their marks: stare for so long that it becomes uncomfortable. Abel has so mastered his own stare that anybody enveloped in his discourse is at a disadvantage. Isaac himself closely resembles Al Pacino’s Michael Corleone—the dark features, the sunken eyes—but that’s where comparisons to The Godfather end. What we have instead is an anti-crime drama. Abel is determined to run his heating oil business with complete legitimacy. His wife Anna, played by the fiery Jessica Chastain, has mob roots—her father owned the business when Abel started out as a driver. Now Abel has ascended to the head of the family company by marrying the mob princess and working incredibly hard. He needs to buy a port on the river from the Hasidic Jews to secure easy access to the oil rigs. Many things stand in his way, including the reccurrence of his trucks getting stolen at gunpoint. Abel faces the struggles of a competitive business, but when put in a spot he makes the strategic move, the right move. He is a self-made man who values logic over compassion. He does things by the books, or at least intends to, and we respect his moral compass. D.P. Bradford Young, who also lensed Selma, bathes the scenes in harsh winter sunlight, creating a rich sepia tone emphasized with lots of beige and burnt orange. Costume designer Kasia Walicka-Maimone adds to the atmosphere with Chastain’s iconic retro sunglasses and Isaac’s bespoke suits and peacoats. The period detail is something distributor A24 has latched onto in their marketing campaign, having created an immersive website (1981.nyc) that features a wealth of photographs from early ’80s Manhattan, as well as articles about the era’s fashion, art and culture. To say the city becomes a character in A Most Violent Year would be true; more accurately, what is personified in Oscar Isaac’s star-making performance is the American Dream. Isaac creates an immensely powerful character in Abel, who can intimidate and ultimately achieve success in a violent business without having to kill anyone. Few can make a glare more believably persuasive than a gun. In some ways, that feels more honorable (actually, in every way). But capitalism inevitably comes with its share of scrapes and casualties, and of course someone does die. And when that does happen, we realize that Abel has never been in control. He is a brake-less driver careening down the Van Wyck, accelerating at an unsafe speed, nearly colliding with each and every obstacle in his path.